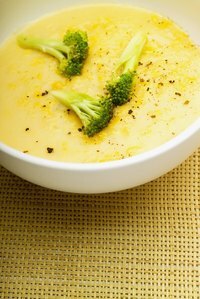 Cream of broccoli soup is a delicious comfort dish that works well as an appetizer or side, but it's also hearty enough to serve as an entree. Regardless, it should be thick and creamy. When combining ingredients in the food processor, add broth and other liquids a little at a time, pureeing as you go, to prevent creating too runny a consistency. However, if you find you added too much liquid, or if the broccoli and other vegetables you included released more water than you anticipated, several alternative fixes can thicken the soup. Puree more cooked vegetables into the soup. Boil more broccoli, Yukon Gold potatoes or white cannellini or great northern beans, then add them to the food processor; these thicken without significantly changing the flavor profile of the soup. Raw avocado works, too, but adds a distinct taste. Separate an egg yolk from the whites and beat it. Add a small splash of hot soup, hot water or hot milk, then add it to the food processor. Tempering the yolk this way prevents it from turning into scrambled eggs in your cream of broccoli preparation. Add rolled oats or finely crushed walnuts, pecans or cashews to your cream of broccoli soup. Puree them in a little at a time until your soup reaches the desired consistency. Nuts do alter the flavor of the dish. Make a roux to add to the soup. Combine equal amounts of flour and either cooking oil or melted butter in a heavy-bottomed pan over medium heat. Stir gently and constantly for 10 to 15 minutes, then add the paste to the food processor a bit at a time. Include cheese in your soup to thicken it. Shredded white or yellow cheddar is a complementary pick; cream cheese works, too. Pour a bit more cream or some coconut milk into the soup a little at a time. Although these are liquids, they add thickness and creaminess to the cream of broccoli.